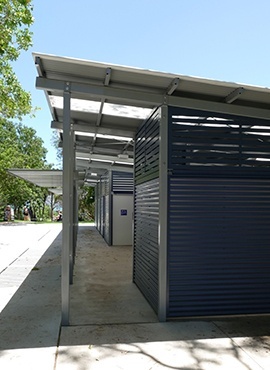 A multi-purpose facility designed and built by Landmark Products is part of a major redevelopment of a popular Agnes Water public park, and serving one of Queensland’s most northern surf lifesaving club. 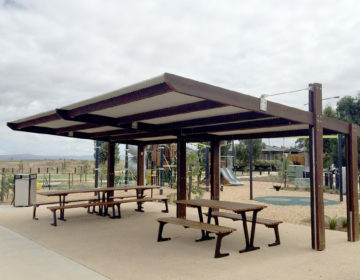 The 157-square metre building is only metres from the beach in Tom Jeffery Memory Park, a park named after one of the town’s founders who established a cattle farm in the region during the 1950s. The redevelopment undertaken by the Gladstone Regional Council also included new pathways and enhancing shower facilities. The previous aging restroom was demolished, but the park remains well covered in greenery, giving ample shade for park goers. A standout feature of the new amenities facility provided by Landmark are the perforated metal screens, finished with surfing imagery, providing privacy for users. These are complimented by powder-coated aluminium awnings over each screen. On the beach side, there is a 50-square metre storage room with roller doors for the Agnes Water Surf Living Saving Club, an air-conditioned first aid room/office, and an access door between the two. 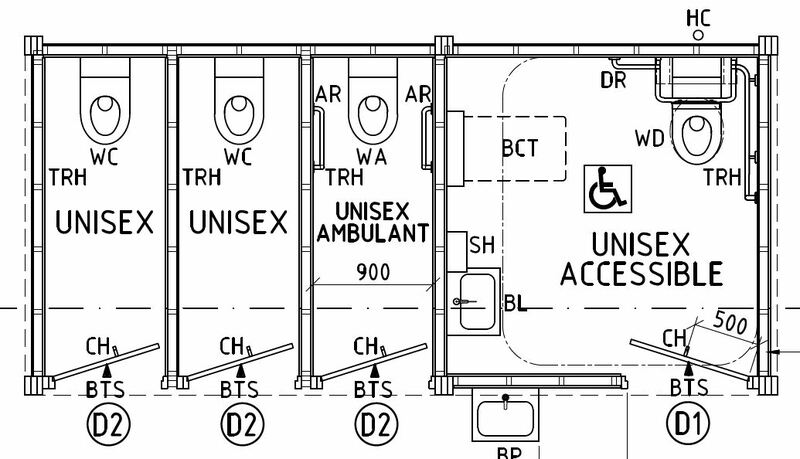 There is also a unisex accessible cubicle, including shower and baby change table, male amenities (two showers, two toilet cubicles, two urinals) and female amenities (two showers and four toilet cubicles). The cubicle doors are finished in attractive laminate (Tawny Linewood). A service duct allows all toilet facilities to be concealed and protected, and Wonderglass roof sheeting provides natural lighting throughout. Three external shower heads, each with stainless steel backing plates and 30-second wall valve line one side of the building. The entire project of upgrading Tom Jeffery Memorial Park was coordinated by local company Gibson Building. Surf Life Saving Queensland regional operations manager Craig Holden said the inclusion of the store room and first aid/office was exciting in two ways. “For the Agnes Water Surf Lifesaving Club it’s a big win but it’s also a big win for Surf Life Saving Queensland because we have our paid life guard service that operates there as well,” he said. Mr Holden said the new first aid room was “vitally important”. “We do treat a lot of first aid cases there, so it’s good to have a good facility that’s going to be close to the beach,” he said. The storage facility was something Mr Holden was particularly excited about. “The local club used to have a patrol shed/hut at that location but unfortunately it was going past its expiry date, we’ve always had plans to build a new one now,” he said. * Comments courtesy of The Observer.